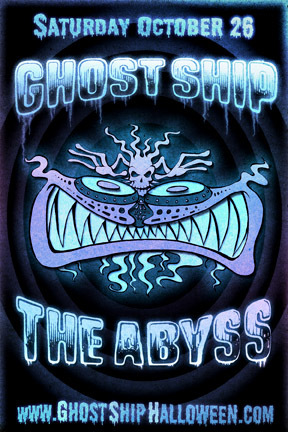 Hold your breath and get ready for a plunge into the Abyss at Ghost Ship Halloween 2013. The city’s most beloved Halloween event is back for a sixth year at an iconic new location, the gigantic Building 12 at Pier 70 in the Dogpatch, San Francisco. For the past five years Ghost Ship Halloween has dropped jaws and thrilled thousands with unparalleled original art installations schemed and built from scratch from recyclable materials and enjoyed for one night only. With past events boasting a Victorian era Ghost Ship, an armada ready steam liner, a high flying Viking ship and an alien space craft hovering over a zombie ghost town, the “Make Big Art” team of artists are hard at work creating a wavy wonderland under the sea. 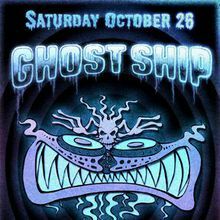 Along with their megalomaniacal schemes, Ghost Ship will again feature original installations by the leaders of the Bay Area’s dynamic large scale production art community, and the world’s most exciting art cars. The soundscape of Ghost Ship will be electrified by multiple stages hosted by top DJ crews and dozens of their finest DJs, all of whom are Bay Area locals. The attendees of Ghost Ship provide the final touch of artwork with original costume culture that raises the bar on pageantry.